heading up to Lexington. It was hard to leave such a peaceful place. had never visited even though she grew up in Lexington. sitting on the left with the curly blond hair is Marta. Her hair has grown back in curly! d back in the 1700s. One of the best tours was the Toyota manufacturing plant, their largest at over 1300 acres, the size of 156 football fields. We were glad we were driven around in a tram. once each foal is born strong and healthy. That is only around 60% of the births. his new braces are making a big difference. ​ It was such a nice end to our rally. The Kentucky Horse Park rally is a joint rally between our club and Country Coach Club. Members Velma Williams and CCI President Lee Zaborowski And CCI Rally Coordinator Tammy Toalson, both also a SECC members, put this rally together for us. George and I have stayed at this park several times. It is a state park that once was a very large thriving horse farm. The site is really beautiful and quiet, set on rolling green hills. It represents the best of Kentucky. As campers we were amazed that we had full access , through the back gate, to the horse park after closing. We rode our bikes around frequently, sometimes driving over in our car over to the small arena where there always seemed to be some horse competition, from dressage to cattle roping. FREE! This should be a really great rally. There are only a few sites left. Won't you join us? Plans for the rally (subject to change) will include 2 catered dinners at the KHP Club House Lounge, 1 “cookout”, 3 area tours (1 by bus, 2 including lunch), evening entertainment and 1 honey wagon service. resort campgrounds, our home for the rally. 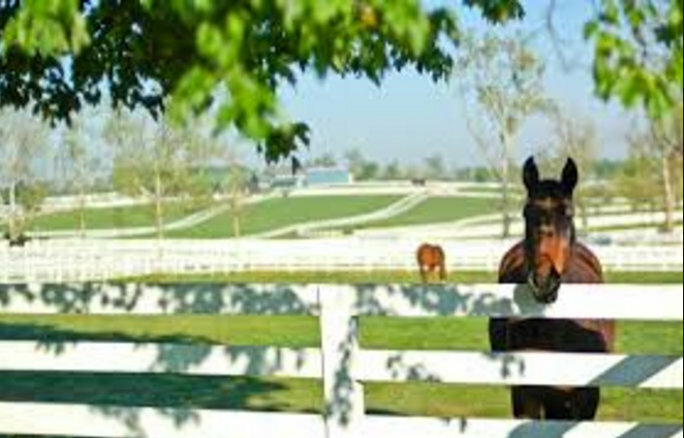 The Kentucky Horse Park (KHP) is the leading U.S. tourist attraction for all things “horse” and one of the world’s best equine competition facilities. This facility has to be on every horse lovers bucket list. Nevertheless, everyone will find this a fascinating destination. One of the aims of the park is to represent every horse in the world so you will see some unusual breeds from around the world. This is home to many of America’s most famous Thoroughbreds; either retired or laid to rest. Your rally package will include admission to the world-renowned International Museum of the Horse, an affiliate of the Smithsonian Institution, the American Saddlebred Museum - the Showplace for Saddlebreds, a Horse-Drawn Tour and equine presentations throughout the day. The Kentucky Horse Park Campground adjoins the Kentucky Horse Park, well off the intertstate. The campground offers 260 spacious sites with 50/30/20 amp electric and water. All sites are 55’ paved back-ins with fire rings and picnic tables. Two dump stations are provided for your convenience as you enter or exit the park. One honey wagon service included. A full service facility, our campground has many extras for your comfort including a grocery store/gift shop and two bathhouses with modern conveniences. During your stay, be sure to take advantage of the tennis, basketball, and volleyball courts, cool off in the junior Olympic-size swimming pool and of course participate in Club planned activities. The Kentucky Horse Park Campground is pet friendly. For those seeking to stretch their legs a little more, venture out on the Legacy Trail, a 12-mile-long (8.5 miles is currently finished) paved walking and biking trail leading from the Kentucky Horse Park Campground to downtown Lexington. Learn more at www.mylegacytrail.com. We Rally Campers will also visit the world famous Kentucky Horse Park as part of your Rally Registration Fee, be sure to wear your rally badge. The Campground Store carries a wide variety of grocery items including ice & firewood plus RV supplies & KHP souvenirs. Access to the campground remains available to campers after hours. **Important fee Information: Your "Rally Fee" covers all rally activities except the campground site fee, which you pay directly to the campground. Choosing OPTION 2 ****Camp Store**** to make reservations. Ask to speak with Dawn and tell her you are reserving for the Country Coach rally. DO NOT to Reserve America. They know nothing! Breakfast daily, Dinner Wed. 18, Thur. 19 and Sat 3/21. Tour of Mt Airy NC, Andy Griffith's hometown, in Andy's Patrol car. Admission to Andy Griffith's Museum. Historic REX Theater and music show. Our nightly rally rate is $55 plus tax ($6.05) plus a Resort Fee of $10 for a total of $71.05. This rate will be honored for 5 days prior to as well as 5 nights following our rally dates. A deposit of $100 is required at the time your reservation is made. Forfeiture of deposit if cancelled within 14 days of scheduled arrival date. The resort is holding 25 sites for the period of one week prior to and one week following our rally so we will not have to change sites during this period. Should you wish to park next to someone specific, please make both reservations at the same time and every effort will be made to accommodate this request. All sites not reserved by February 15th will be released for general reservations so if you want to park with other SECC Members, you should reserve your site prior to this date. Visit WWW.BUENAVISTARVRESORT.COM to see the beauty details of this facility. Please do not make your reservations through the website as you will not receive the discounted rate and potentially not be parked with other SECC Members. Reservations should only be made between 9am & 5 pm (CST) by calling 251-980-1855 and you should tell them you will be attending the SECC Rally. This rally is designed to be a time to relax with friends and experience the beauty of this resort and surrounding area. We are not planning activities during the day but will provide a list of “Sites to See” and “Things to Do”. Breakfast will be catered at the resort each morning, Dinner and music will be catered on Saturday evening at the resort. We will have dinner reservations at popular restaurants on Sunday & Monday where attendees will pay their own checks. Cost for this rally is $100.00 per person. For Non-SECC attendees please add $35.00 per coach. Don’t forget to book your site. Call Pine Mountain RV Resort – 866-929-0586 & please tell them you are with SECC. · Dinner on your own. · Day on your own to tour the area. · Have a safe trip home & thanks for coming. We need this as soon as you register. Callaway Gardens & Warm Springs Georgia have a lot of beautiful things to do and see. Bring your walking shoes and camera. Cost for this rally is $205.00 per person. For Non-SECC attendees please add $35.00 per coach. INCLUDES: Dinner on Wednesday, 3/11 @ Pontchartrain Landing; Evening/Jazz Cruise with Dinner on the Natchez Steamboat on Thursday, 3/12; Admission to the World War II Museum with box Lunch at the Museum and Dinner back @ Pontchartrain Landing on 3/14. New Orleans is a city with something for everyone! Wednesday will be a “free day” to see these and/or other attractions! Hello to all attendees of the Hampton Roads Maritime Rally set in Virginia Beach, Virginia! We have 67 people in 33 coaches attending the rally to date. The POE (Plan Of Event) below is intended to enable you to better plan your free time and enjoy the events scheduled as a group. Hank and I will be available to offer suggestions beyond your handouts for places to visit, eat, people watch, or other things to do if you wish. You just need to ask...now or during the rally. The POE is subject to change, so make sure you double check the one included in your Welcome Pack when you check in. We look forward to seeing all of you in about 3 weeks. Drive safely as always. Breakfast served daily 0800-0900 at Safari Café on campsite grounds beginning Thursday September 11 (included in rally fee). · 4:00 Happy Hour at Waterman’s Beachfront Restaurant (not included in rally fee) followed by dinner (included in rally fee). Drinks at dinner other than tea or soda are not included in rally fee. We encourage carpooling with free Valet parking at restaurant. · 9:15 depart campsite via POV to tour Nauticus Science and Maritime Museum, the USS Wisconsin (BB 64), largest US Battleship (included in rally fee) ~ carpooling recommended. · 12:30 board the American Rover (1:00 sail), a short walking distance from Nauticus, to Sail the Norfolk Harbor aboard 135 ft. 3 masted schooner, box lunch provided (sail and lunch included in rally fee). Refreshments and water for purchase. · Or tour MacArthur museum, Pagoda, MacArthur Mall, stroll down Granby St. Norfolk has Light rail, there is a ferry boat to Portsmouth and multiple sights to see over there as well. Too many to mention, too little time to do it all, you’ll just have to come back for another visit! · Dinner & evening on your own. There are some nice restaurants within easy walking distance in Norfolk. Todd Jurich’s (across street from Nauticus entrance), Shula’s in the Marriott Hotel several blocks east of Nauticus entrance, and there are multiple choices back at the beach area north of the campgrounds. Check with Hank or Stevie for other suggestions to fit your culinary taste. · 9:45 Depart campsite via busses for driving tour of World’s largest Naval Base (Norfolk Naval Base). No lunch is provided so you may wish to bring a snack to tide you over until our return to campsite. · 2:30 Return to campsite via busses. · Free day to tour area, Go Cart track, Water Park, Virginia Beach Aquarium all within walking, biking, or driving with ample parking for these venues. · The Old and New Cape Henry Lighthouses are at the north end of the beach – about a 7 mile drive up General Booth Blvd which changes to Atlantic Ave. at Rudee Inlet bridge. · Boardwalk is easy ‘people watching’, bike riding, or walking and just 2 miles north from campsite. Parking can be challenging. Campsite has its own parking lot on a first come basis. Parking garages are available for a fee. Norfolk is a Mermaid city. When downtown, see how many you can find…. Virginia Beach is a Dolphin city. When out and about, see how many you can spot…. Lots of GREAT photo ops! We are still looking for volunteers to host at least two additional rallies in 2016. If you have an interest in hosting, please contact me to discuss. through. Anyone up for just meeting the first week in May for an unofficial get-together for good food and relaxation? Lake Toxaway, Asheville, Chattanooga, suggestions? Plans are firm for the Virginia Beach rally, Sept. 11-15. hosted by members Hank and Stevie Giffin (757-583-8350 slgiffin@cox.net). This is going to be a fun rally at a great location and we are sure everyone will want to arrive early and leave late. We will camp at Holiday Trav-L-Park, two miles from the oceanfront with its many restaurants, shops, beach, and boardwalk. There is a great bike path and the campground owns its own parking lot at the beach. We will tour Nauticus (maritime-themed science center & museum) and the Battleship USS Wisconsin (BB64) (www.nauticus.org), plus take a harbor cruise on the 135 ft. 3-masted topsail schooner American Rover (www.americanrover.com). Other available tours include the 800,000 gallon Virginia Aquarium (www.virginia aquarium.com) just 2 miles away; the Virginia Beach Military Aviation Museum (one of the largest collections of WWI and WWII era military aircraft in the world – www.militaryaviationmuseum.org) 10 miles away; the Ocean breeze Waterpark one mile away (www.OceanBreezeWaterpark.com); and a tour of the largest naval base in the world. This week precedes the Blue Angels air demonstration show (Sept 19-21) that you can see right from your site or see things close up at the nearby Naval Air Station Oceana. Demand for sites will be high. Registration forms will go out later as we firm up activities and cost. With the huge success of the Jacksonville rally the excitement about this rally reached many CCI members who will also want to join us. We have a goal of 50 coaches and regional clubs are invited. Don't wait and regret that the sites near the SECC group are all gone, or that all sites are gone, even in this large park. BOOK NOW! Go to www.campingvb.com or call 800-548-0223 and ask for June .Be sure to let them know you will be attending the SECC Rally. Hank and Stevie negotiated discounts and reserved 30 Super sites at a rate of $66.87/night and 10 Full Hookup (no cable) sites at a rate of $38.48/night. These rates are also applicable 3 days prior to and after the rally dates. These sites will be held for us until July 11th. If you want to arrive early or stay late register now, as the sites around our dates book up early. The very reasonable cancellation policy is shown on the website.